After 34 years as a song enjoyed by drunk people wearing loud Hawaiian shirts, Jimmy Buffett's Margaritaville becomes a virtual online playground for drunk people wearing loud Hawaiian shirts. No, the Hawaiian shirt is not optional. 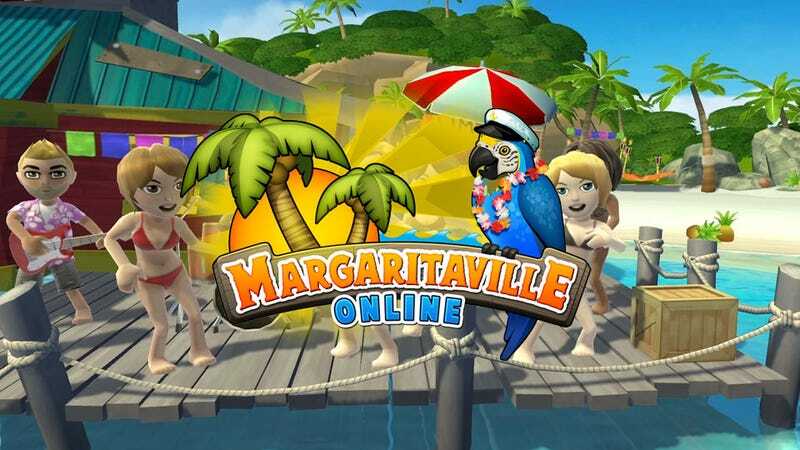 Magaritaville Online is a virtual buffet of Buffett coming to Facebook and iOS devices this fall courtesy of THQ and developer Exploding Barrel Games. Fans of the gracefully aging singer, songwriter, author, and entrepreneur can follow in his flip-flopped footsteps in this island paradise. They'll be able to start a band, open up a restaurant, go on tropical adventures, or just stand around partying while listening to Buffett sing about those things, just like they do in real life. Along the way they'll interact with characters from Jimmy's books and music, such as Captain Tony from "Last Mango in Paris", and I'm sure there will be plenty of parrots and cheeseburgers to go around. "The Margaritaville laidback state of mind is inherently social, and THQ has captured the spirit of that lifestyle in this game," said Buffett. "With Margaritaville Online, fans across the globe can party together any time and any place." Many questions still remain unanswered about the game. Will the fins be to the left, or to the right? Will the level cap stop at 40? Where are we gonna go when the volcano blows? Hopefully these questions and more will be answered when THQ debuts Margaritaville Online at E3 2011 next month.